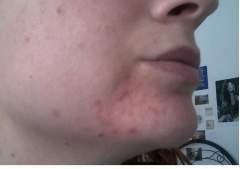 about 5 months ago my very mild acne started to got worse .....now i have a lot of red marks and a few little scars, the worst side is the right one. I don't know if they're going to fade and when, I've got them for the past 4 months or more...also, I have sensitive skin and dermatitis, suddenly my skin got very strange. Do you think these marks will go away? what can I do?